When people go looking for hell, they go underground. Dante, Aeneas, and Odysseus all journeyed beneath the earth to find the underworld, a place where the dead are tortured according to their sins. Buffy the Vampire Slayer had to deal with a huge underground pit infested with demons below her high school called the Hellmouth. And when Homer Simpson ate the forbidden donut for which he’d sold his soul to the devil, he was sucked through a fiery hole in the ground. Though humans actually haven’t gone more than 7.5 miles into the earth, we associate this mysterious underground realm with darkness and death, and the depths of the earth’s interior remain an inspiration for writers and artists trying to imagine hell. 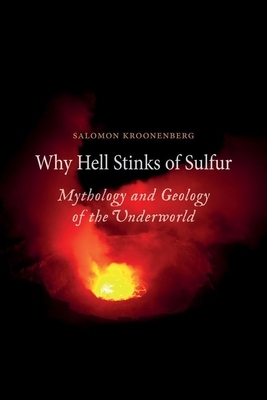 Why Hell Stinks of Sulfur uses subterranean mythology as a point of departure to explore the vast world that lies beneath our feet. Geologist Salomon Kroonenberg takes us on an expedition that begins in Dante’s Inferno and continues through Virgil, Da Vinci, Descartes, and Jules Verne. He investigates the nine circles of hell, searches a lake near Naples for the gates of hell used by Aeneas, and turns a scientific spotlight on the many myths of the underworld. He uncovers the layers of the earth’s interior one by one, describing the variety of gasses, ores, liquids, and metals that add to the immense variety of color that can be found below us. Kroonenberg views the inside of the earth as a living ecosystem whose riches we are only beginning to discover, and he warns against our thirst for natural resources exhausting the earth. From the underground rivers and lakes that have never seen the light of day to the story of Saint Barbara—the patron saint of mineworkers—Kroonenberg’s pursuit of the geological foundations of hell is a fascinating journey to the center of the earth. Salomon Kroonenberg is professor emeritus of geology at the Delft University of Technology. He is the author of The Human Scale. Andy Brown is a translator specializing in Dutch. His translations include The Encyclopaedia of Liars and Deceivers, also published by Reaktion Books. He lives in The Netherlands.